MS Dhoni’s glove work behind the stumps has never been questioned. 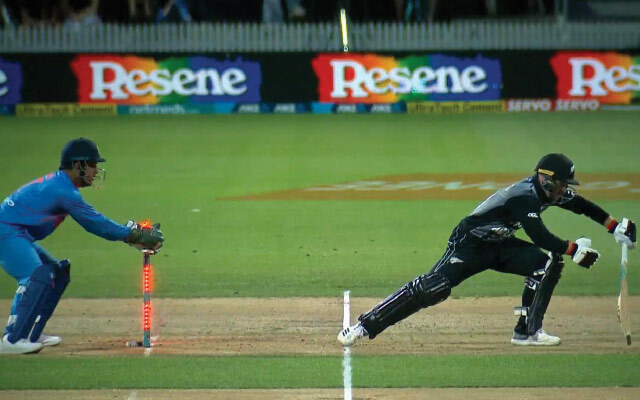 Another reason for the same was visible on Sunday during the deciding T20 International between New Zealand and India at the Seddon Park in Hamilton. New Zealand got off to a brilliant start once again after being put in to bat first. Tim Seifert and Colin Munro made the most of the fielding restrictions before the former was undone by the brilliance of the Indian veteran. The incident took place in the eighth over of the innings when Kuldeep Yadav was bowling. The chinaman got some assistance from the pitch straight away and troubled the Kiwi openers. Both the batsmen didn’t understand his variations and Seifert missed a wrong ‘un from Kuldeep only to see MS Dhoni whip off the bails in a flash. Dhoni looked confident at that point in time but it was very close when the replays were shown. The third umpire was in trouble once again and was in focus again after a howler in the second match. This time Chris Brown was under the scanner and after watching several replays, he decided to rule Tim Seifert out. MS Dhoni had made a valuable breakthrough for Team India. It was such a quick work from him to disturb the stumps that didn’t even give a chance to the batsmen to being his leg back in the crease convincingly. Though the final decision was questionable once again from the third umpire, it proved to be a crucial wicket for the visitors. Even the Indian players were all over MS Dhoni after the batsman was adjudged out as it was some sheer brilliance from the veteran behind the stumps. Meanwhile, Twitterati was also in awe of Dhoni who is only getting younger with his exceptional wicketkeeping skills. New Zealand are looking good to post a huge total once again but the flat pitch also offers the Men in Blue to bat and it will be an interesting game. Seifert unlucky to be given out. Benefit of the doubt should always go to the batsman.